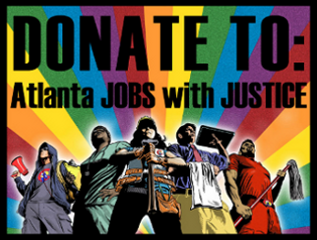 Atlanta Jobs with Justice is taking action in solidarity with the 45,000 Verizon Workers fighting for a fair contract. We will be flyering at the Verizon Store on Ponce de Leon at 7:45 AM in conjunction with the release of the new iphone. The Communications Workers of America and the International Brotherhood of Electrical Workers, joined by allies including MoveOn.org, the AFL-CIO, US Action, Jobs with Justice, and National People’s Action are launching the nationwide iWont Campaign, asking Americans to delay upgrading to the new iPhone 4s on Verizon Wireless until the company agrees to a fair contract with its workers. Since August, 45,000 Verizon and Verizon Wireless workers have been fighting to protect their health care coverage and other standard employee benefits against company demands for massive takebacks that threaten tens of thousands of middle class families. 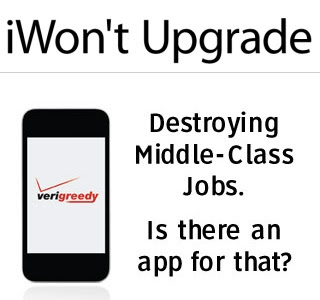 The coalition will also work to expose the “Verizon Tax Loophole” – the tricks and tax dodges Verizon and Verizon Wireless use to pay nothing at all in federal corporate income taxes even as they make billions in profits, pay their top 5 executives hundreds of millions of dollars, and undermine the American Dream of good middle-class jobs. As Congress considers ways to close the deficit, the CWA and its partners will lead a grassroots campaign calling on lawmakers to force companies like Verizon and to pay their fair share in federal taxes and respect workers’ rights.